This FDK 0.15-50KW wind-power generator system controller is the effective control device and it is the necessary accessory to the generator system. It is the combination of the electric battery, the cabinet and the reverse-exchange device of electric circuit with the function of automatic rectification charge and automatic protection. It can be used to charge A/C generated by the wind-power generator to D/C for charging the battery and to supply the reverse the electricity for transmitting the electricity for the outdoor usage. There are two constructive forms of this system subject to the different installation places: One is of high protection class system installed beneath the pole of the generator. It is mainly for producing the power of 1KW and below. And the another form is installed in the room. The out-put voltage can be selected by the user. 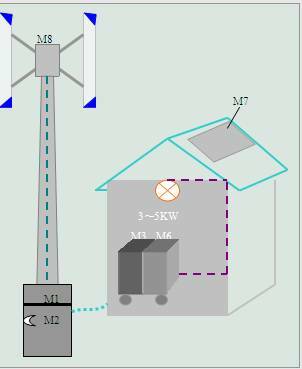 General idea for the selection of the system: Normally people have to consider the following facts when they are going to select the generator system: Power, Voltage, Price, Wind-force and the Installation Position of the wind-power generator (M8). Some facts can be consulted with the local electric engineers. 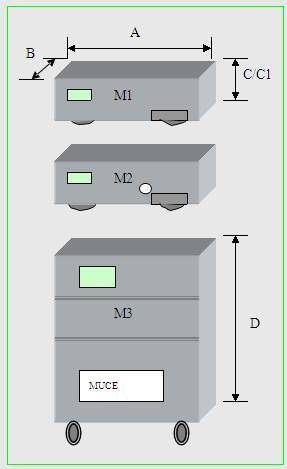 The selection of the power generated by the generator is subject to the consumable power ( Normally the former should be 30% bigger than the latter). For example, if the consumable power is 750W, the power generated (M8) should be 1KW. The out-put voltage of system controller ( M1,M2,M3 ) is selective of DC 24V, 48V or AC 110V, 220V, 380V and 440V. The battery group is designed on the standard of 5-8 hours' usage per day. Some special design will be required if longer usage time is needed. M7 is the solar energy board for the customer's selection: Controller of M1 and M2 of 1KW or below can be installed both indoor or outdoor. This system can be operated both with the electric net or independently.